Elisa has been waiting for this day for more than two years. It takes her a minute to realize what she is holding. Yikes! We do have to be careful about Gilla. 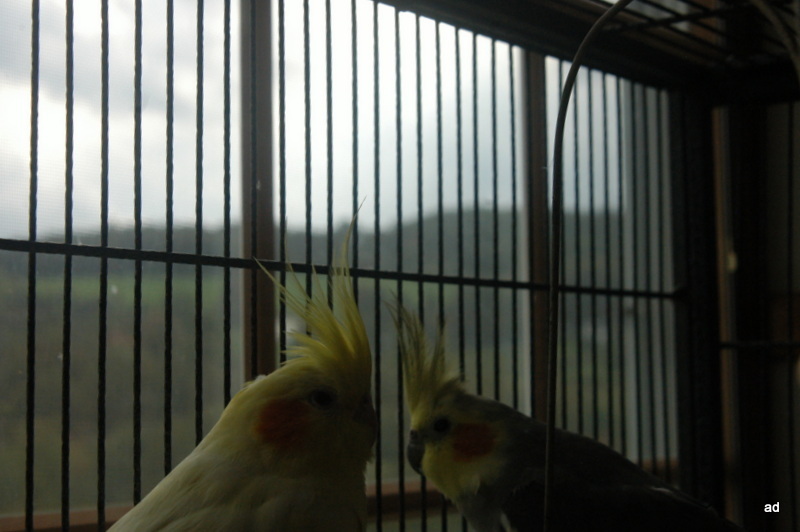 She is mostly outside but she came in yesterday and H said she saw Gilla look at the bird cage and then lick her lips. So excited for Elisa and her new bird family! Question: did the birds arrive in the MAIL? I know they didn’t fly to your place themselves, but I’m having a little trouble understanding the pictures. Happiness, yes. But the mechanism of the happiness is unclear to me. I was working at a market and an organic vegetable farmer who lives nearby asked if we had horses and mentioned that he hoped to get a couple but first needed to find a happy home for his cockatiels. The rest is history. That explains the seed box for transportation. We put them in the box thinking it would be less stressful for them if they were in the dark. 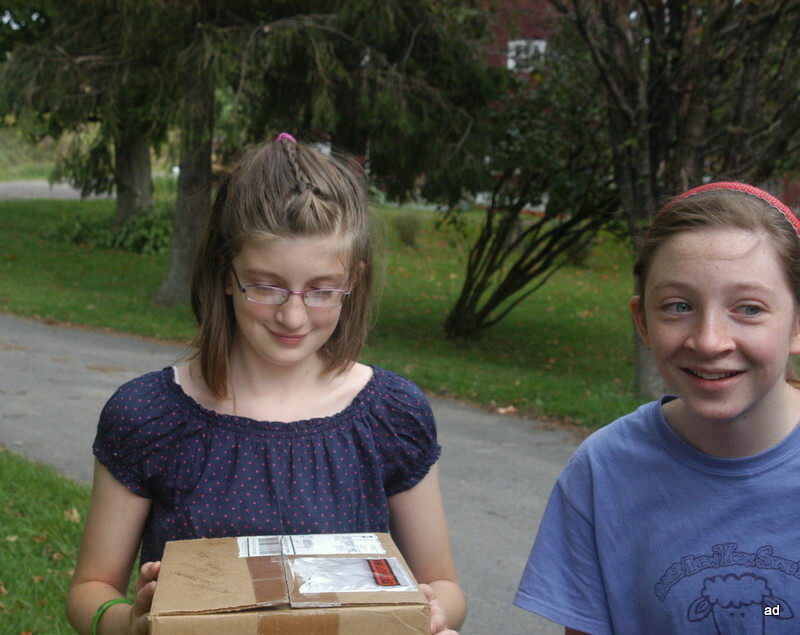 I drove into the driveway just a second ahead of the school bus and handed Elisa the box as she walked across the yard to me. I’m so glad Wendy asked that question. I saw this a day ago but didn’t get to say that it is one of my very favorite posts ever. So Elisa has been wanting pet birds for two years? Will she teach Sunshine and Petey to talk? So exciting that they liked your food. Hi Linda! Elisa has big plans for training. First, she wants them to come and sit on her finger and it may not take as long as I thought. Today they were so relaxed and she discovered that Petey LOVES popcorn and will go almost anywhere for it. 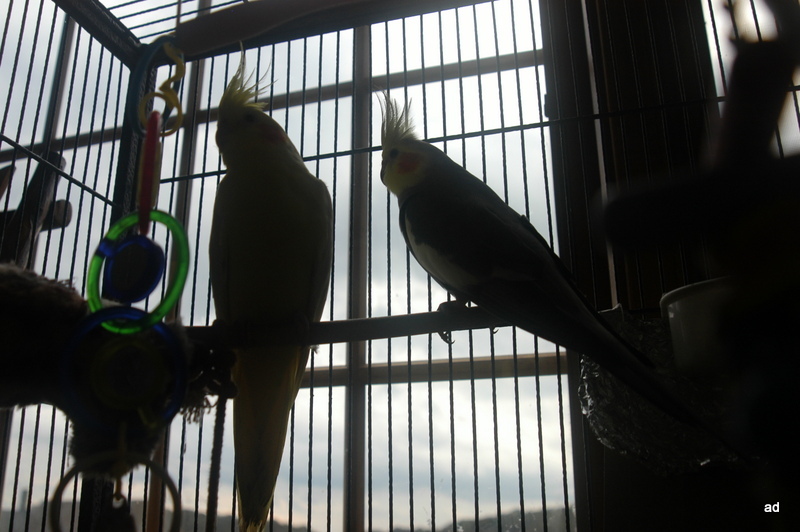 Sunshine is younger and she copies whatever Petey does so she’s working on him first. Such expressive birds and so much fun! Oh and yes! For two plus years asking on a very regular basis, “When will I get a cockatiel?” Very regular (sometimes daily). She has been reading everything about them during that period too and is pretty much a walking encyclopedia on cockatiel behavior. She was not expecting TWO and I’m so glad it worked out that way.They keep eachother company. Plus, down the road she can hatch out some babies. Too wonderful. Does your cat seem interested? Yes and no. She was on high alert this morning but when I told her to knock it off she went and took a nap and she slept all day. Cats!